I don’t really know how you define food trips but let me share with you my view and take on adventurous food trips, the Tuscany Way! If there's one business district that chains the energy of classy urban living and the sophistication of Europe then, it's McKinley Hill at the Fort Bonifacio in Taguig. From the magnificent buildings, striking landscape down to the artistic architectural design of the high-end structures, McKinley is truly beyond imagination when it comes to modernization in the Philippines with a brush of a western culture. If you are on the lookout for that perfect place to dine with family, friends, and loved one, then you might want try out the different restaurants in McKinley Hill that will take you to different places around the world with its unique flavors. It has different kind of foods: Italian, Spanish, American, Japanese, Mexican, Asian, and many more. What’s more amazing about Mckinley Hill is its selection of food. It offers not only the best tasting but also rare dishes that only they can offer, including dishes that you thought you wouldn’t find here. 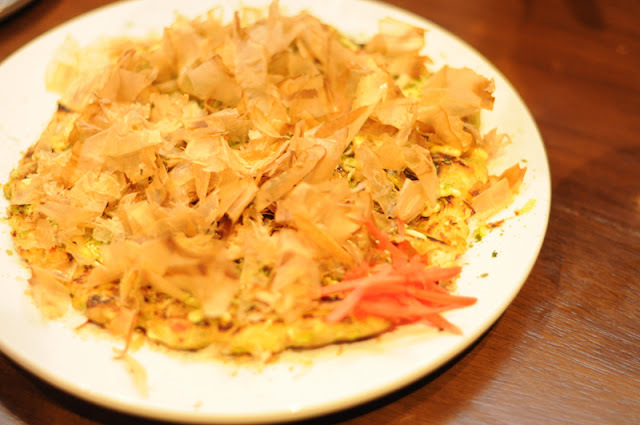 New York style bagels, kebab on a sword, okonomiyaki … yes you read it right! 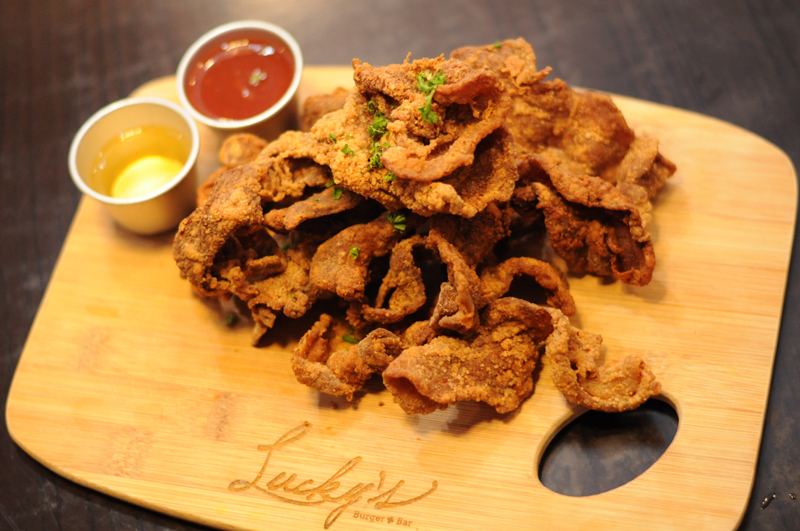 Who would have thought that these different kinds of food is within our reach now at Tuscany in McKinley Hill? So what more can you ask for? Aside from having a European vibe, dining with delicious and mouthwatering food is the best feeling ever. Last August 19, I have embarked on a journey in McKinley Hill together with my colleagues to try out dishes from 10 different restaurants. Let me share with you what we had in this glorious food adventure. Craving for authentic Spanish cuisine? 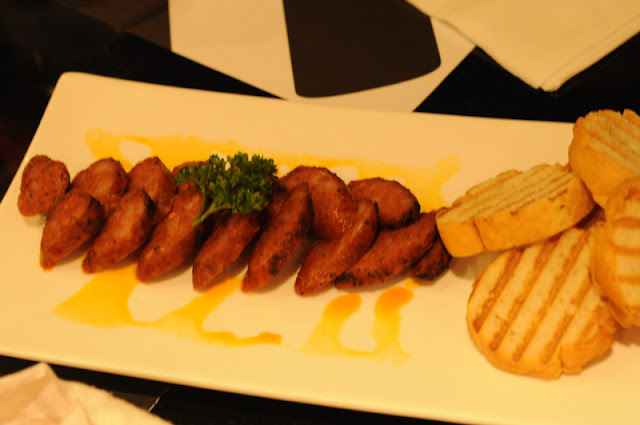 Try the Chorizo on Piggy Back at Terry’s Selection, with a chorizo composed f one of the world’s best spices Pimenton de la Vera, an exquisite Spanish spice with no preservatives that was the first to acquire the coveted status of denominacion de origen. Served in a piggy clay pot that is fuelled with brandy and flamed on one’s table, it’s a delicious and dramatic way to kick start one’s meal. Craving for fries? 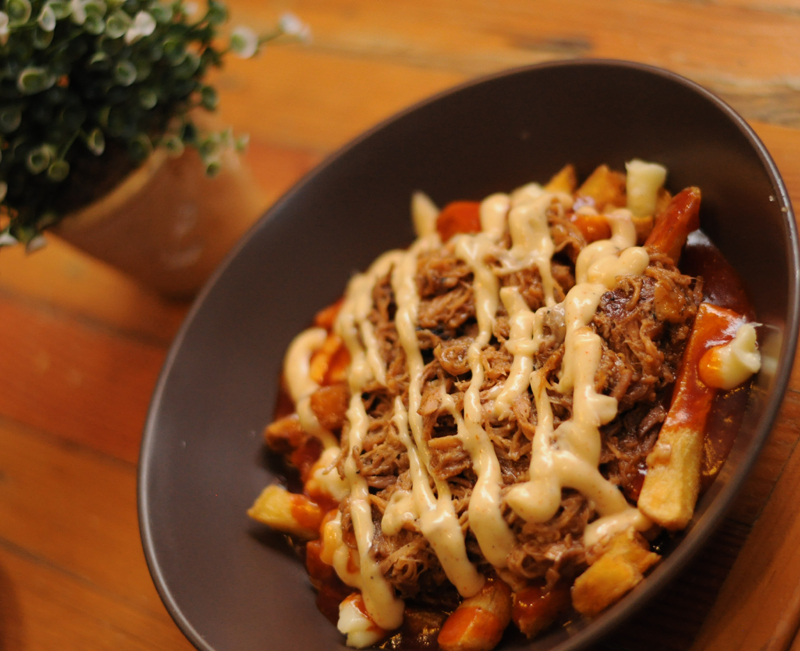 Enjoy this classic in a new way with Main Street’s Pulled Pork Poutine, an addicting combination of hand cut fries, pulled pork, cheese curds, barbecue sauce and spicy mayo. Great when paired with beer! Craving for Breakfast Food? Try an iconic New York breakfast staple-bagels, cream cheese and lox. The LES Addiction at L.E.S. 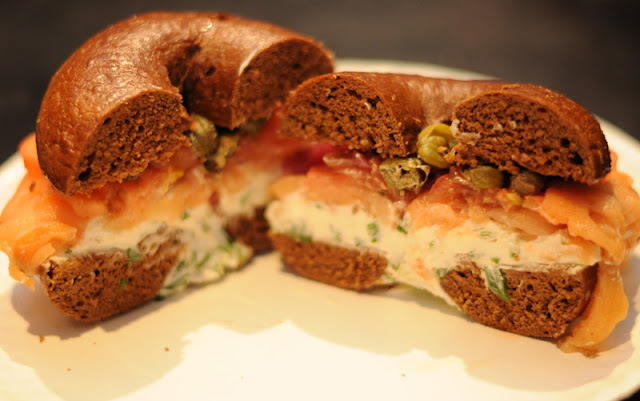 Bagels is the perfect introduction to this classic dish, a Pumpernickel Bagel with Sliced Lox, Scallion Cream Cheese, Capers, Red Onions and Fresh Tomatoes. Craving for Bacon? Try the Bacon Chips at Lucky’s Burger- salty, smoky bacon with store made sinamak vinegar, chili garlic sauce, salt, pepper paprika and chives. The bacon dish is the perfect mood-lifter and it’s great for breakfast, lunch, dinner or even as a midday snack. means what you like and “yaki” means grilled. Nihonkai Tsukiji’s offering is deliciously crispy on the outside and soft on the inside filled with egg, cabbage, pork, seafood, topped with mayonnaise, dried seaweeds, and dried fish flakes. Craving for award-winning Thai Food? 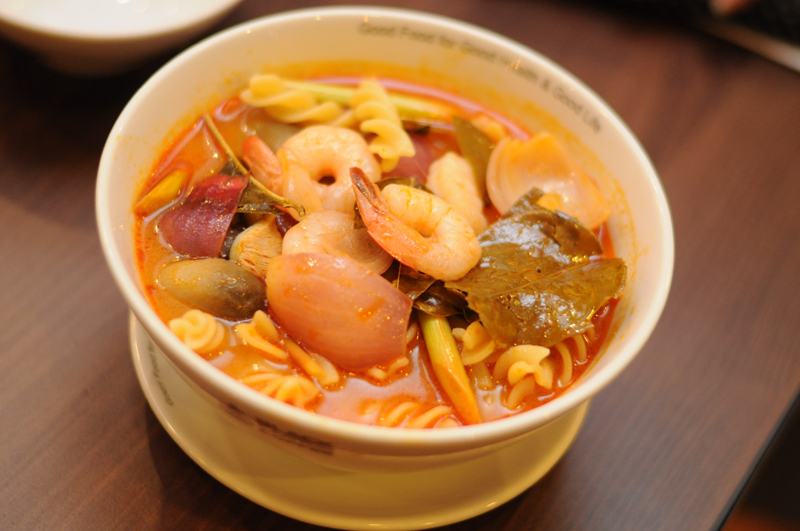 Black Canyon Coffee’s Tom Yum Soup is the winner of the TOM YUM THAILAND CHAMPIONSHIP. This dish is perfect for those who love spice and it’s great for heating one up during the rainy weather. Black Canyon’s Tom Yum has prawns, galangal, kaffir leaves, lemongrass stem, onions, straw mushroom, chili oil, fresh lime and coriander. 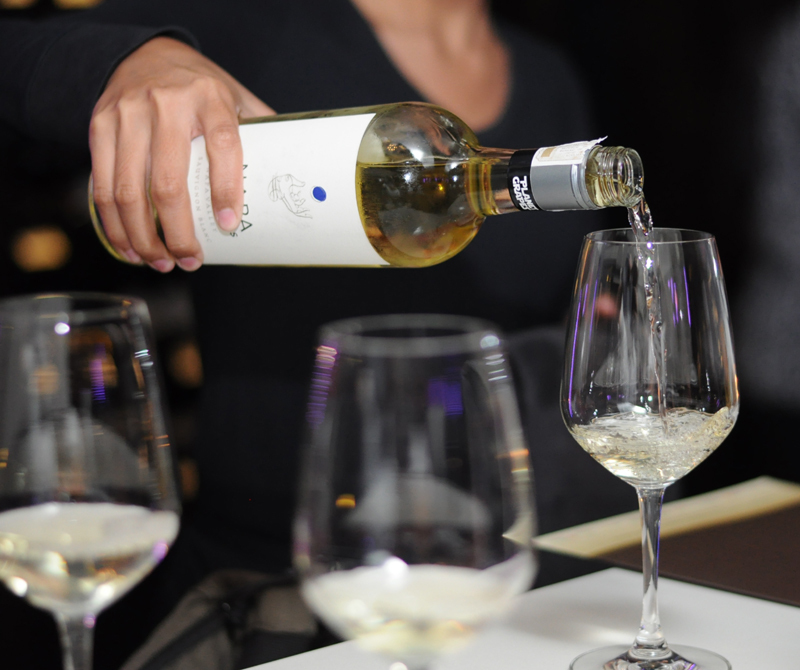 Craving for wine? 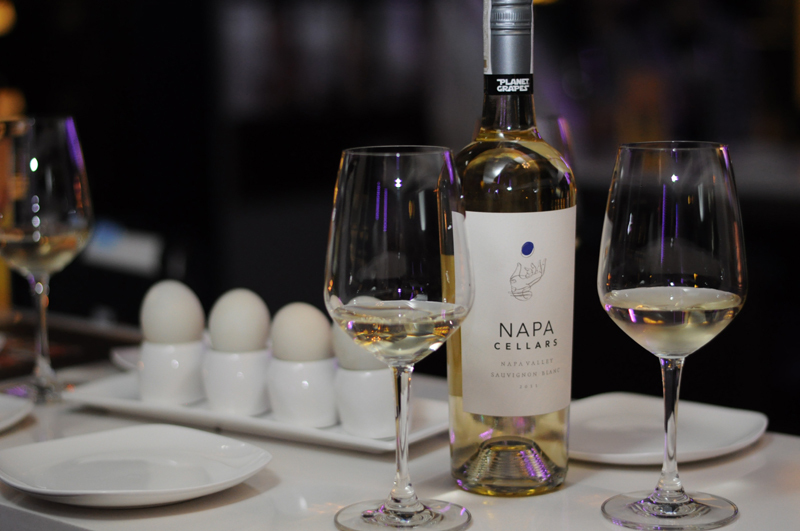 Chardonnay is traditionally known to go with fish, but Planet Grapes is inviting guests to explore how well local street food pairs with wine. 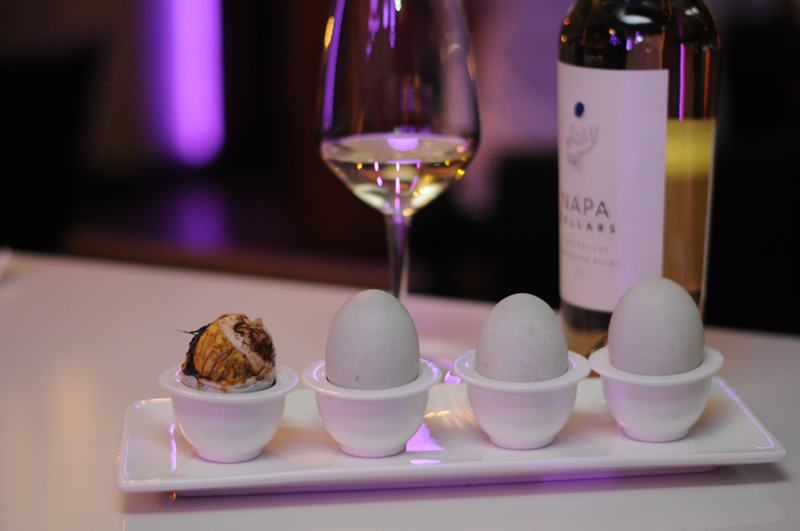 In this adventurous pairing, Planet Grapes is offering their Sauvignon Blanc with Balut, the quintessential Filipino street food. Craving for meat? 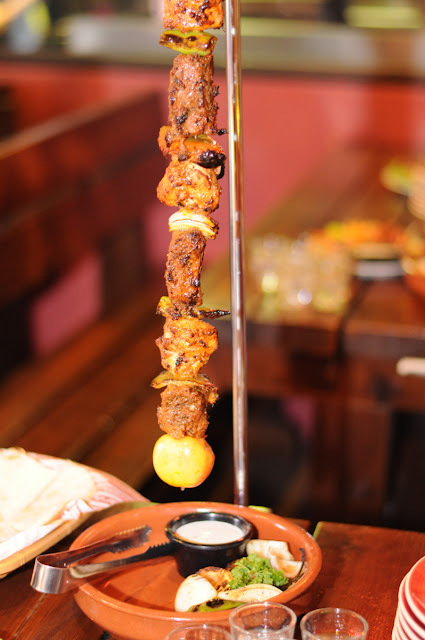 Take on the Excalibur Kebab-beef and chicken, seasons with oregano, paprika, cumin, salt and pepper and more, served on a sword! Garnished with bell peppers, onions, tomatoes and with pita bread and salad for sides, the Excalibur Kebab is a monster of a challenge for a group of friends! 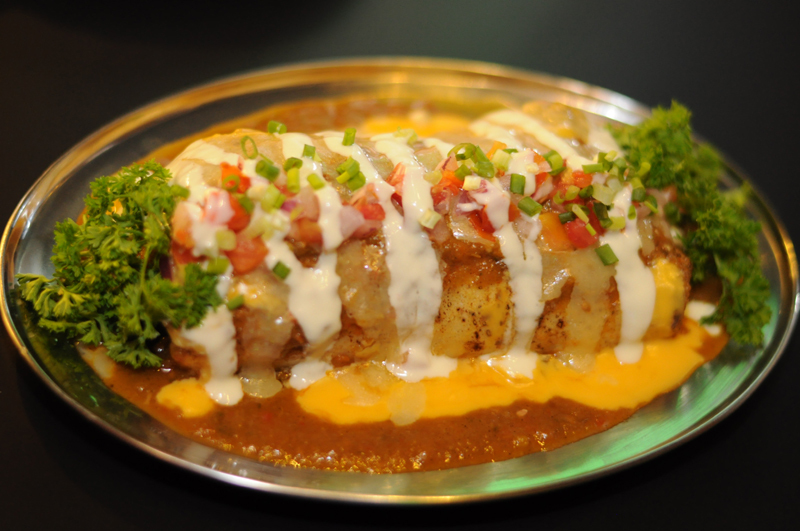 Craving for Mexican? Try the Beef Barbacoa Burrito at B&T Mexican Kitchen, loaded with imported beef and cheeses, rice, beans, corn and veggies plus different Mexican sauces! 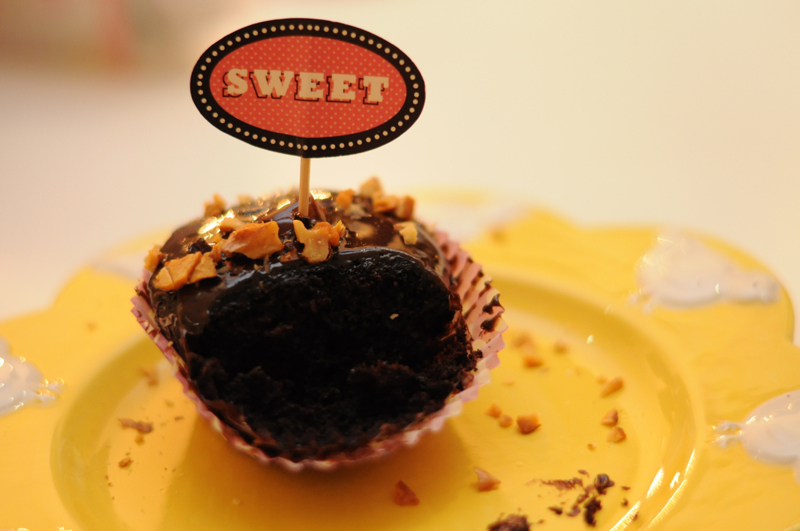 Craving for Sweets? 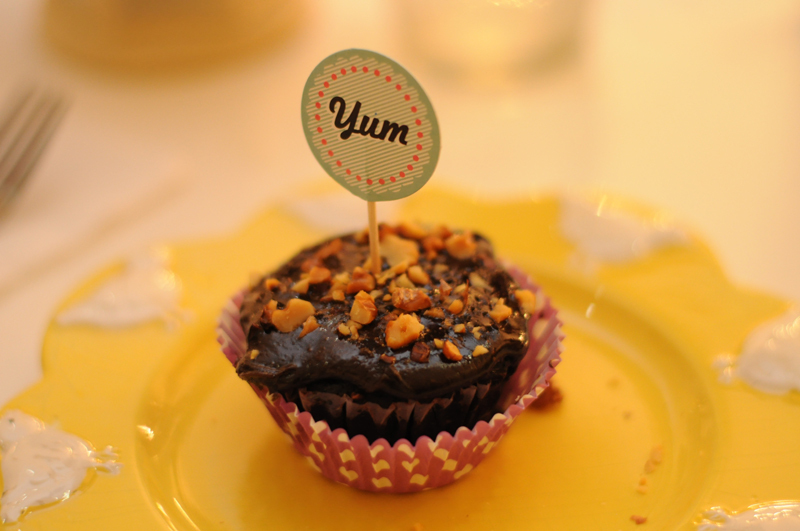 Try the Chocolate Cupcake with Valhrona Cacao Nibs, made by esteemed Fresh chocolatiers and imported Maldon Sea Salt. The nibs provide texture with its subtle crunch while the sea salt provides a delicate balance to the dark chocolate glaze. 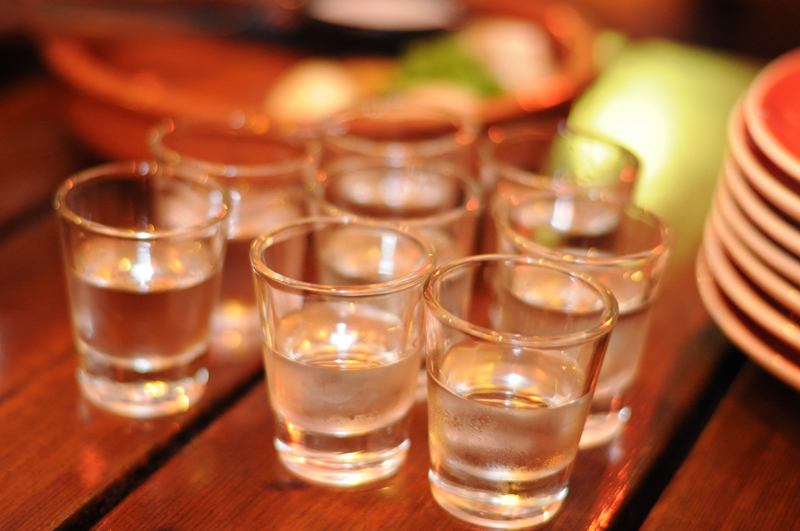 Surely, time flies when you are having meals that are luscious, tongue-talizing, mouthwatering and lip smacking. Spoil yourself once in a while because we deserve this kind of luxury after working our butts off to be where we are right now. This event has helped me relieve stress and enjoy life. They say that a trip helps broaden one’s horizons. Well, I’d like to think that this trip broadened not just my waistline but my food horizons, too. For more information on the Cravelist in Tuscany at McKinley Hill, call the Megaworld Lifestyle Malls Concierge at 709-9888, 709-9888, 709-0888 or 0917-8380111.